Sunday’s Edinburgh derby is heading for a sell-out, with only a few hundred tickets remaining for the Tynecastle showdown. 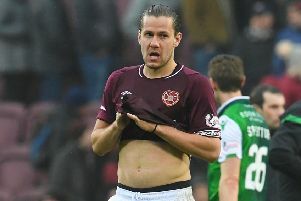 Although city rivals Hibs could have the chance to confirm Hearts’ relegation if St Mirren avoid defeat at Inverness the previous day, home supporters have snapped up tickets in their thousands. Hearts officials expect the stadium to be completely sold out by the time the game kicks off at 12.45pm on Sunday. Hibs have already sold their entire 3500 allocation in the Roseburn Stand, hoping to celebrate their opponents’ slide into the Championship. A Hearts spokesperson said today: “Despite Sunday’s match being shown live on television, there has been a huge demand for tickets. We expect to have the ‘sold out’ signs on display before kick-off as, even at this stage, only a limited number of tickets remain to be sold. Hearts manager Gary Locke confirmed that he hopes to have Paul McCallum available to face Hibs after the striker missed last Friday’s encounter with Dundee United through injury. He was due to resume training at Riccarton today. • To buy tickets for Sunday, call 0871 663 1874 and choose option 1. Alternatively, you can visit the Tynecastle ticket centre or www.heartsfc.co.uk.